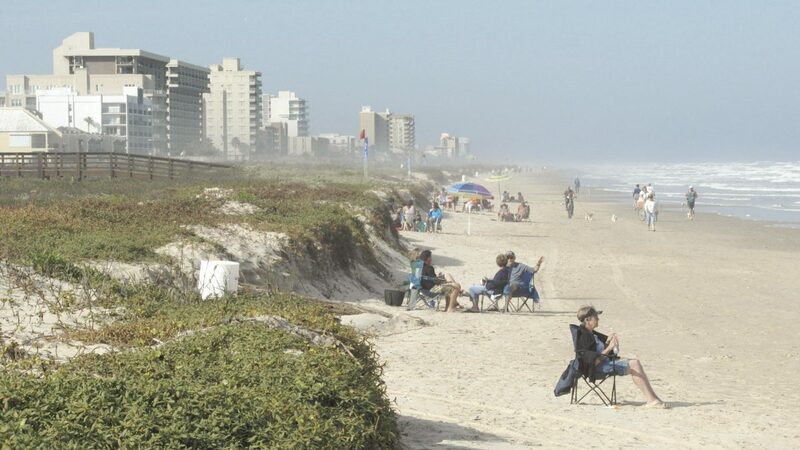 SOUTH PADRE ISLAND — Visitors don’t seem to mind the changes they are seeing on the Island’s beaches. Right now the beach line is narrow and the Island’s sloped dunes have turned into five-foot cliffs. But don’t worry, when the steamy summer returns so will the Island sands. It’s “winter” beach season, when beaches erode and flatten out, often giving the appearance of a lower beach. Winter beach is a natural occurrence. It is the natural redistribution process of the island sand. In the spring and summer the sand returns to the beach. Now, the beach and dunes are undergoing a seasonal transformation from a “summer” beach to a “winter” beach. During the winter months, the city monitors the sand that washes out and back into the water. The storms in the winter create waves that are larger and more energetic and lower the beach as sand is pulled off shore. The sand actually remains in the beach system and is stored within the Island’s three sandbars. Stahl said as the Island beaches evolve throughout the year, city officials are constantly watching them change and taking care of them. “They are our number one asset and we have to take care of them year around so when people are around they are pristine, clean and wonderful beaches,” Stahl said. Island leaders seek to maximize the benefits of the dune system by improving beach maintenance practices. As storms and wave heights (along with a general change in wave and wind direction) increase during the fall and winter months, beach berms and sometimes the dunes erode in response, lowering the beach as sand is pulled offshore from the upper portions of the beach and deposited in protective offshore sandbars. The result is typically a flatter, more concave beach shape. The sandbars that form offshore in winter help protect the beach by causing waves to break farther offshore. In the late spring and early summer months, smaller, calmer waves dominate, and sand slowly returns to the beach and berm, and the beach and dunes typically recover, as long as sediment is not lost offshore. The key to this equilibrium is the berm, which is the part of the beach that changes most during the seasonal cycle.